The discussion took place in the framework of the charity screening of film "Haytarma"
The Crimean House in Kyiv hosted a charity film about the deportation of the Crimean Tatars "Haytarma", which was attended by Deputy Chairman of the Mejlis of the Crimean Tatar people Ilmi Umerov and his daughter Ayshe, according to the information on her Facebook page. “Today's screening became another one in the campaign "25 ° C. Put the cold on a pause," which aims to raise funds to buy fuel for boilers and burzhuks to provide heeting for the entire heating season for 20 families living in the war zone in eastern Ukraine," she wrote. 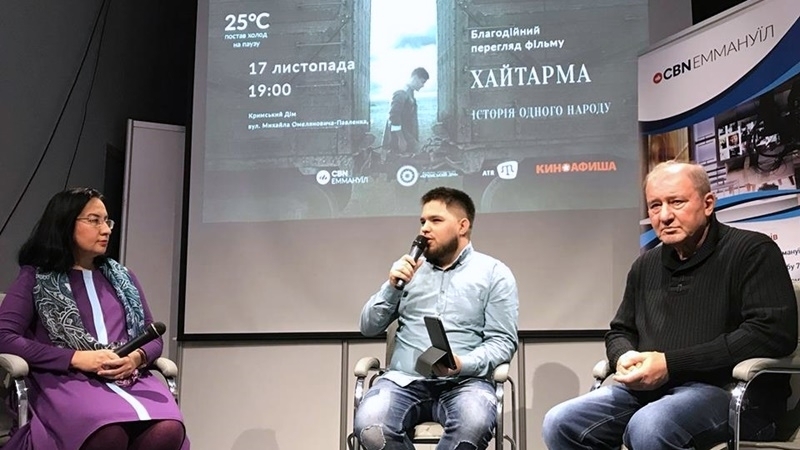 Ayshe Umerova noted that before the show Ilmi Umerov and the historian Gulnara Bekirova held a discussion on the returning of the Crimean Tatars to their homeland after the deportation. QHA reported that on November 16, Radio Hayat celebrated two holidays at once: Radio, Television and Communication Worker's Day, and its first small anniversary - 100 days of work. Among the guests of the studio were Deputy Chairman of the Mejlis of the Crimean Tatar people Ilmi Umerov and his daughter Ayshe.